Festive Friday 2012 – Week 8 | Who Are You Calling Crafty? Welcome to Festive Friday 2012 Card Number 8. 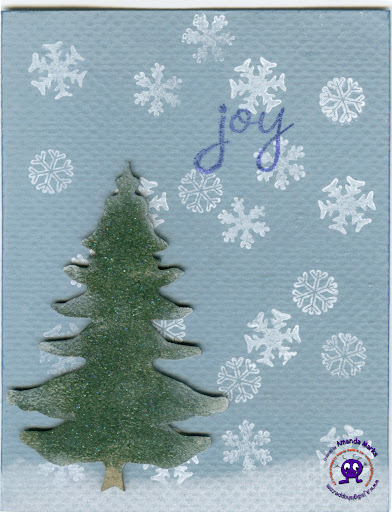 I really wanted to use my New Fiskars ’tis the Season stamps (I got them for a steal at Joann’s $1.97) for this card. Love all the snow flake stamps for the background and I love that tree! You can never go wrong with snowflakes, in my opinion! 🙂 Very nice texture and dimension with the background cardstock and the tree, great card! Your card turned our cute with the tree! 🙂 I think I need some pan pastel.